It’s a sure sign that Christmas is on the way when the decorations go up at the home of Jim Ennis Sr. along Route 6 in Wysox Township (top). Read about Mr. Ennis at http://wysox.org/uploads/Jim%20Ennis%20Sr%20-%20revised%20B.pdf. 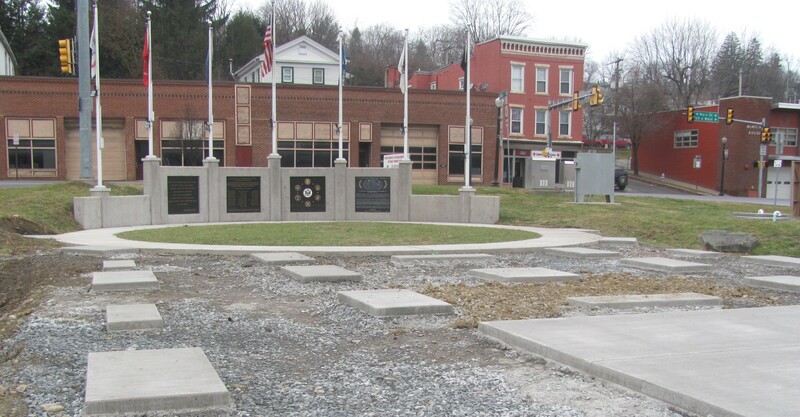 Meanwhile, across Veterans Memorial Bridge in Towanda, work on the Bradford County Veterans Memorial Park (above) continues. Engraved pavers honoring local veterans will be installed as weather permits. According to www.waynesweatherworld.net, a string of milder but mostly cloudy days might be followed by some light snow this weekend. Wayne is feeling pretty confident that we will have snow on the ground on Christmas Day.